Who would have ever thought that over three years into a bull market, on a day when only two S&P 500 stocks hit 52-week lows, those two stocks would have been MSFT and DELL. Have a good weekend. On Wednesday, we highlighted how the only other period where the S&P 500 had a weaker performance following the end of a recession was in 1970. We also began a series of posts which highlight how this recovery stacks up against other recoveries based on a variety of economic and market indicators. Today we continue the series with a look at two more indicators- corporate profits and PE ratios. 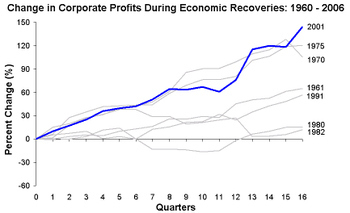 The chart below shows that of the seven recoveries since 1962, corporate profits have risen at a faster pace than any other recovery since 1962. Clearly investors should be bullish, right? 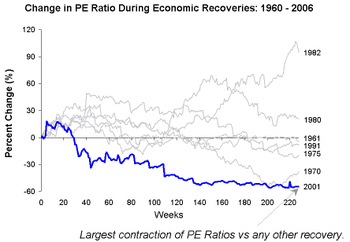 One way to guage investor optimism is to look at the market’s PE ratio during each period. While there can certainly be other factors at work, generally speaking, high P/E ratios indicate that investors are willing to pay more for every dollar of earnings (optimistic), and low P/E ratios indicate the investors won’t pay up for earnings (pessimistic). As shown in the chart below, investors must have gotten up on the wrong side of the bed at the start of this recovery, and have been in a sour mood ever since. Since November 2001, the P/E ratio on the S&P 500 has not only grown at a slower pace than any other expansion, but it has actually declined! Following up on last week's post, "Fed Pause Good For Stocks", the chart below expands the composite performance of the S&P 500 to include the market's performance during the entire rate hike cycle. The shaded area represents the S&P 500's performance during prior rate hike cycles since 1962, while the blue line highlights the market's performance during the current period. For the purposes of this analysis, we are inferring that the last hike of this cycle will be on May 10th (we know the market has wrongly assumed several times as to when the cycle would end, but for now we'll stick with that date). 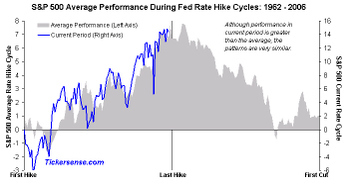 Besides the similarities in the pattern of the current tightening cycle versus the average of prior periods, what we find noteworthy about the chart, is that for all the attention the Fed gets, the end result is that from its first hike in rates to its first cut, the S&P 500's average performance during the entire period is an unspectacular return of 1%. Ironically, while the market rallied yesterday on hints that the Fed may end its rate hike campaign, this chart would indicate that if anything, investors may want the Fed to keep going. "In stock specific news, XOM is set to open lower after a disappointing earnings report even though earnings grew 75%." These sound like this morning’s headlines, right? Actually it’s a summary of market headlines from October 28, 2004, the last time China unexpectedly raised its interest rates and XOM reported 3rd quarter '04 results. We found three analyst recommendations worth pointing out this morning. 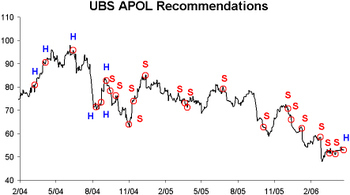 APOL was upgraded at UBS from "Reduce" to "Neutral." Prior to this morning, the analyst had a "Reduce" rating on the stock since September of 2004, and the stock is down 30% since that time. 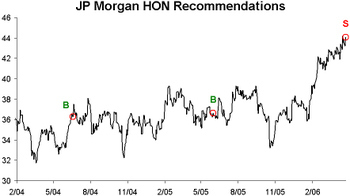 HON was downgraded this morning at JP Morgan. Although the analyst has had relatively few calls on the stock, we wanted to point this one out because the analyst went from "Overweight" to "Underweight." 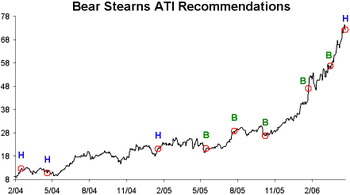 Finally, ATI was downgraded at Bear Stearns this morning. A couple weeks back we highlighted when Matrix downgraded the stock at $65. Since then the stock has continued its ascent and closed yesterday at $72.23. Maybe Bear's call will be a little more prescient. Just a reminder that the Birinyi Reminiscences Newsletter goes out this evening (the last Wednesday of every month). Now you can sign up for the service by simply clicking a subscription plan at the top of the left-side column on this page. With the service you'll receive our monthly newsletter written by Laszlo Birinyi (there are plenty of neat charts and tables like the ones on this site) as well as our weekly Birinyi Stock Ratings. You can view samples of each in the left-side column as well. Since the economy bottomed in November 2001, the S&P 500 has risen over 12%. 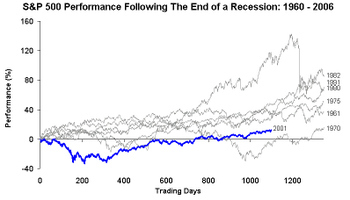 This represents the second weakest showing of any four and a half year stretch following the end of a recession since 1960 (even after taking into account the gains the market has had during the third longest rally without a correction ever). 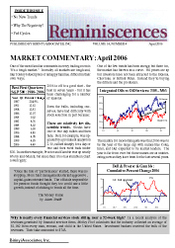 While there have been several theories as to why this period has been weak when compared to others, we thought it would be best to compare not only the market’s performance coming out of a recession, but also look at a variety of market indicators spanning the economy, commodities, market valuation, etc. 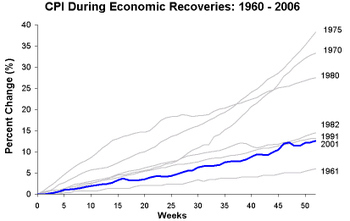 Therefore over the next several days we plan to highlight these indicators when compared to other recoveries. Today we will start with gold and inflation. 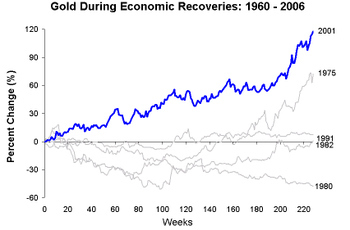 Gold's performance during this economic recovery has been the strongest of any other period for which data is available. This strength has led many to believe that inflation, as it has in the past, would follow gold's lead. However, during this period the CPI has grown at a pace that would be considered low by historical comparisons. Now we know that many will take issue with how the government calculates the CPI, but at the same time its hard to argue that inflation is anywhere near the levels it was in the 1975 period when gold had similar (although not as strong) gains. CNBC just reported that the Bush Administration was going to temporarily halt deposits to the country's Strategic Petroleum Reserve (SPR). We find the timing of this announcement curious for two reasons. First, the Strategic Petroleum Reserve has been seeing net withdrawals for over six months now, as the reserves peaked in August (or else there is a whole in the bottom of the tank), so today's announcement is nothing new. 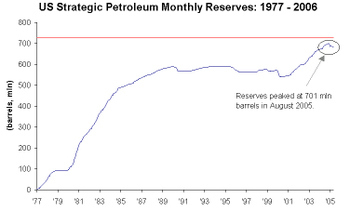 Second, the current level of reserves is at 684 mln barrels while the total capacity is 727 mln barrels- that's 94% full. So even if they were still adding reserves, there's not much left to put in anyway. But while we're on the subject of the SPR, we would note that it has become quite a nest egg over the last few years. With oil trading at $73 per barrel, it is now worth roughly $50 billion. 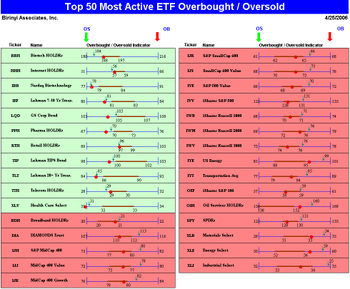 Green sectors are currently oversold while red are overbought. Neutral sectors were left out. Thursday's release of the American Association of Individual Investors (AAII) Survey showed bears outnumbering bulls by a 41% to 34% margin. 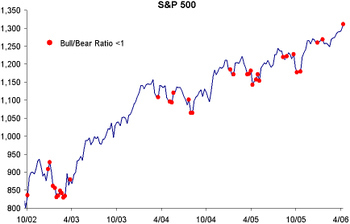 As the chart below highlights, while occurrences of bears outnumbering bulls have not been uncommon, it is not common for this to occur when the market is hitting new highs.